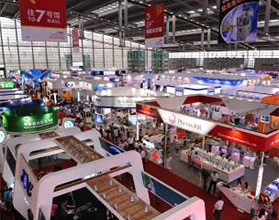 China International Optoelectronic Expo (CIOE) was opened at Shenzhen Convention and Exhibition Center for visitors from around the world on September 2, 2014. One of the largest optoelectronic exhibitions was held from September 2 to 5 in Shenzhen, China. The exhibition brought together experts in the fields of optical communication and sensors, lasers and infrared systems, precision optics and other areas of the optoelectronic industry. More than 3,200 companies presented the latest technologies and trends in optoelectronics. Managers of the Photonics. World of Lasers and Optics exhibition took part in the CIOE trade show with a booth in order to develop cooperation and attract participants and visitors to the March 2015 event in Moscow. 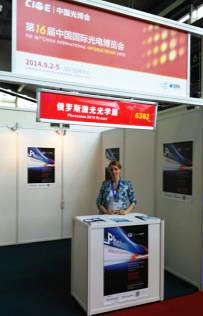 We presented the 2015 exhibition and held negotiations in order to raise awareness and familiarize COIE participants with opportunities and prospects of the industry development in Russia, CIS and Eastern Europe and business opportunities open to participants and visitors to the Photonics Lasers and Optics 2015 exhibition. We have done our best to ensure that information about the Photonics. World of Lasers and Optics 2015 exhibition reached every participant and visitor. This will significantly expand the horizons of influence and pave the way for strengthening business contacts in order to support exhibitors and attract visitors to our event.